Happy first day of September! Can you believe it? Time to officially count down to fall...though it's going to be 95 degrees in Boston today- so perhaps not quite yet. Charlotte Russe necklace- fun and very Fenton Fallon for J.Crew, but a lot cheaper! i need to get back over to the Loft. used to work there and spend WAY too much money. lol. What a pretty dress!! Charlotte Russe has such nice accessories! I used to work there. Loft? Never heard of it. I'll have to check it out! I'm obsessing over your entire outfit. That dress, that necklace, those shoes- all fabulous! Great wednesday look! loving your outfit today jamie! I'm so plain. 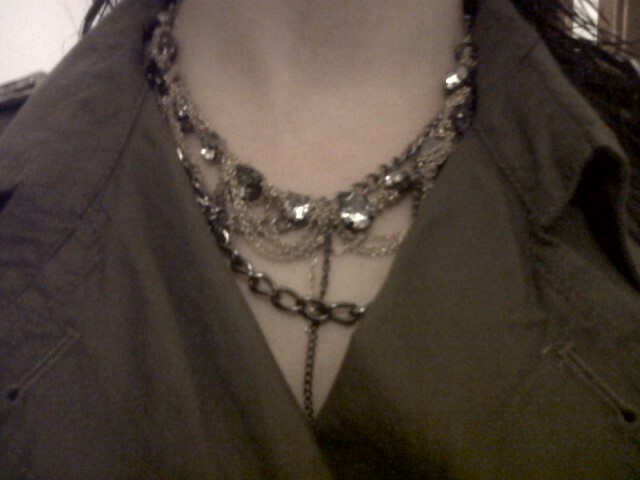 Express gray editor pants, a black H&M tee and an amethyst stonre necklace that was a gift! Haha, still in my blogging pj's but now motivated to find an inspiring look for today:) Great ensemble! I really do love this outfit...smart...not too overdressed, but you could wear it anywhere! LOVE your What I'm wearing Wednesday! That trench dress is divine! That dress looks great on you, I love the colour! You look beautiful, luv the necklace! Today I am wearing a silk tank top with an orange, yellow and olive green print, and olive colored linen capris. that necklace is super, super cute dear! you look fab. The detailing on that necklace is superb! I love it! lovely outfit, you look gorgeous the colour of the dress really suits you! Super cute dress!! I Love the trench look... super classic and this has such a fun little twist to it! I am in love with that dress girl, work it! You look fabulous! that is such a cute dress11 And I love how you accessorized with those necklaces! Love the dress and the necklaces! you look fab. Fabulous outfit, Jaime! 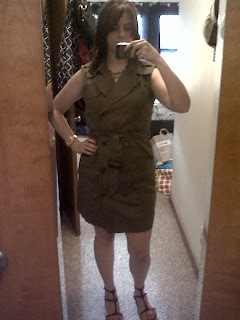 The trench dress looks fantastic on you and I love the necklace! Love the dress AND the gorgeous neck candy! Don't judge but...I'm still in my pjs. HA!